This is a Monster Cake! Your kids will love it! And it's full of tasty chocolate! What are you waiting for? Show them how to prepare one now! Help your kids to learn how to cook indian samosas showing them this wonderful and colorful game that will drive them through entire process. Enjoy this cooking game following the in-game instructions in your kitchen to serve a yummy and healthy seafood ragout! Ice Cream! The dreams of your kids come true! You can teach them how to do a gorgeous ice cream with this game! They'll will love it! Fish pizza is an unusual pizza recipe! This is why it's even more fun to make one! And remember, fish is the one of the healthiest food ever! The most famous italian dish ready to be cooked and prepared through this fun cooking game! A little bit complicated but a very yummy recipe! Prepare your stuffed hamburger with your favorite ingredients. Learn to used the oven to get a tasty hamburger for you and your friends! Salads are the best way to eat healthy but tasty food. They are easy to prepare too! Find how playing this game now! 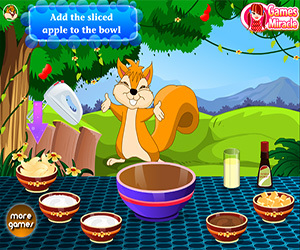 Cooking Games for Kids is the central hub about educational cooking games. We think that to play is important, but to learn too! And what is the best way to gain confidence with cooking and baking rather than begin to play? Baking could be complicated when kids are participating in. Thanks to the Internet you can show them how to do simple recipes (despite virtually) without any dangerous hassle. Meanwhile, you can begin to show your kids how to mix the ingredients correctly to have a meal that is tasty but healthy too. You know that the obesity is one of the most dangerous illness? Starting to eat healthy when you're young is important! Show to your children how to do it! Too, they'll learn how to use computers properly. Another fundamental skill nowadays! So, we have games that are funny but instructive too. All for free, online! And they are made by the best game makers in the educational field. They will show you how to cook a lot of recipe. Learn to prepare salads, sandwich, sushi, lasagna, cakes, cupcakes, donuts and a lot of other yummy dishes. And you can have fun learning how to act in your kitchen, in a fast food or in a restaurant kitchen. But, there's no need for reservations. There are tables for all! What are you still waiting for? Play one of our cooking games for kids now!